I undertake author visits at Society of Authors rates. I can also work with your school to develop a tailored creative writing project that is unrelated to my own books (for example, if you want a group of students to have creative writing workshops, leading to an anthology). Please contact me if you have an idea you would like to discuss. I’m based in Birmingham, UK, but can travel. Aside from my experience as a published author, I have an MA in Children’s Literature (Roehampton) and an MA with distinction in Writing (Warwick). Recently I developed and taught a highly successful module in Writing for Children and Young People at the University of Warwick. I was previously a children’s bookseller for five years. I am a member of NAWE, IBBY and the SCBWI. 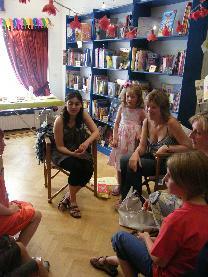 I deliver creative writing workshops for adults who want to write for children, as well as general writing workshops. Please contact me to discuss your project. I love helping other people write their novels. If you would like to discuss support for writing your novel (only if it’s a novel for children or teenagers), please contact me. Depending on how busy I am, I may be able to work with you to improve your novel for children or young adults and bring it as close as possible to publishable quality. I don’t critique novels for adults or picture books since these are not areas in which I specialise as a writer. It’s an in-depth written report on your book from a professional, objective reader. It is not a copy-edit. It won’t point out every spelling error or re-write your novel for you. What it will do is focus on large questions: is the plot working? Are the characters strong enough? What is your theme and how can exploring it make your novel better? What can you do, practically, to improve your novel, and encourage agents and editors to take it on? HOW DO I KNOW IF MY BOOK IS READY FOR ONE? A manuscript critique obviously represents a large financial investment in your writing. I would advise anyone to think hard about whether they’ve really reached the stage where they will benefit from it. First of all, have you finished writing your book? It might seem obvious, but you should have a full draft of it before sending it in for a critique. If you yourself don’t know how the story ends, it’s hard for anyone else to give you a fair over-view of it. Ideally, before getting a critique done, you will have re-drafted and self-edited the novel a good deal. You may be feeling ‘stuck’, unsure how to proceed. You may feel as if you’ve spent so much time on the novel that you no longer have any idea if it’s good or not. You may be thoroughly sick of reading the thing! You may have submitted it to editors and agents and only had form rejections, or comments like ‘I just didn’t love the book enough to take it on’. (That is a perfectly good reason not to publish a book. but it doesn’t help you make yours more lovable). Consider, too, whether you, the writer, are psychologically ready for a critique. A writer will only benefit from a critique if they are prepared to work on their writing. This doesn’t mean that you should feel compelled to act on every suggestion made in the report, but if you are not open to constructive criticism, you won’t be able to make the most of the report. The question you have to ask yourself is HAVE I GONE AS FAR AS I CAN WITH THIS BOOK, ALONE? If the answer is YES, that’s probably a good time to get a manuscript critique done. Hello Leila. I am interested in your manuscript critique service. Emma Darwin suggested I contact you. Do you have an e-mail address?